At First, It seems to be luxury than a necessity. But in real life, this is an amazing product which can save your back and shoulders and help you to relax and get your milk flowing as well as keeping your baby comfortable too. There aren’t so many baby products like the nursing pillow that can give you such ROI (return on investment). You can get it just less than $50 and use for months for relaxing. Isn’t it good to invest that amount in an amazing breastfeeding pillow? Here’s our article will help you to find the best breastfeeding pillow. From the hundreds of manufacturers like kidilove, ergobaby or boppy, we have reviewed the 8 best breastfeeding pillows. Take a look at our review and buy the best one from it. From the last century till now Boppy Kept the first position among all nursing pillow manufacturers. Their 90/10 poly-cotton made, c-shaped pillow wraps around your waist and the firm inside it provides perfect support to your baby. You can use this amazing pillow from breastfeeding to being able to sit on the floor while playing. In addition to breastfeeding, this multi-use pillow can be used for different stages of development like propping, tummy time and learning to sit. This is the most versatile one available on the market. The beautiful cotton slipcover is machine washable and it’s really easy to unzip it from the pillow. You can wash this slipcover many times as the quality of this cover is quite good. Check the price of this Boppy pillow in solid white. Don’t forget to buy a colorful slipcover to customize this Boppy Naked pillow as like as you want. If you want to get the Boppy Classic Feeding & Infant Support Pillow, which is ready made with cover, click here. The first advantage over Boppy is that it’s not too round like boppy which doesn’t sit on your waist right. My Brest Friend wins major points with moms especially for its’ sticky feature, it stays securely in place and does not slide like other pillows. 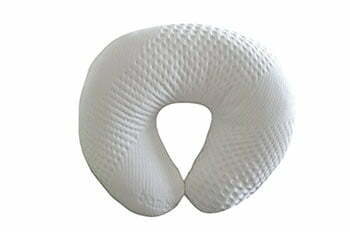 This is one of the best nursing pillows for c section recovery as well as for tall mom. 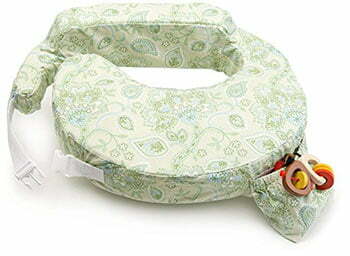 Wrap-around design secures the pillow to attach to the body and helping mom to maintain ideal positioning for baby while breastfeed, and of course without any back pain as it supports your lower back. A convenient pocket gives you an extra benefit of keeping water bottles or other products within reach. You can also buy extra cover with variety colors and designs. Really there is nothing negative to say about this product, I have read most of the review comments of this product and more than 90% said that this is the best in the world ever! Check the price and buy. Though the outlook of this pillow is similar to the above, structure is totally different. It’s specially made for travel, if have to fly a lot and this will be an absolutely brilliant product for you. This pillow allows you to blow it up quickly and easily with its valve. Blowing doesn’t need any pump, you just have to blow air by breath and it will take only 30 seconds to inflate completely. Thinking about leakage? Don’t worry, the seller will provide a warranty on it. There is no other product like this which can be as much travel-friendly as this pillow. Just blow it up before use and pack it up before travel. I think it will be a great deal within its price range for those moms who travel frequently. The unique feature of this pillow is that its cover is made from feather-soft bamboo-polyester blend fiber, which made it anti-allergic. So this smooth pillow cover protects your baby’s skin from irritation. The soft and comfy cover used on this pillow is much better than the expensive brand. The pillow is made of 100% polyester which assured its durability. As it’s made of polyester, its machine washable and will remain soft after washing. Though the arms are too small to relax, I think overall it’s a light, soft pillow with high durability and reasonable price. 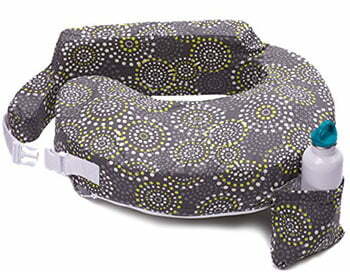 This is another one by Boppy, they bring this breastfeeding pillow with great usability. It has two distinct feeding surfaces which can support you need while you’re breastfeeding your baby. The firm surface features a soft fabric which provides a stable platform for breastfeeding, while the soft surface offers a cozier as baby grows. Its wide arm fits most of the moms and the removable belt keeps baby feel easy while breastfeeding. 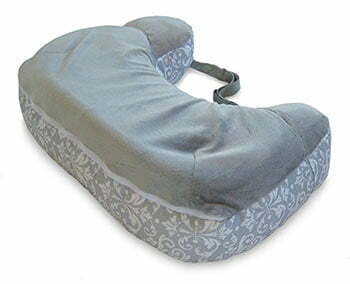 The pillow is bigger than traditional Boppy and it include a foam insert. You can wash it but you have to remove the foam insert before wash. If you are searching pillow for a tiny newborn baby, I will recommend buying this. It will provide you the height you needed in the first month while the classic Boppy was too short. Besides its little edge prevent your baby from slipping. Some moms complained that they got some rash on their legs when they have used it wearing shorts. But I have used this personally and have not faced any problem with it like them. The L shaped Luna Lullaby Bosom Baby provides the perfect position to raise your baby up to breast level making the breastfeeding easier. You will be able to use it longer than other smaller pillows as your baby grows. For you and your baby’s safety, there is no zipper or Velcro. Don’t worry, though there is no zipper or Velcro, the cover is removable and you will be able to wash it or wiped it with a damp cloth. The built quality of the pillow is great with the soft cover. Price range is also high enough according to its quality. For its shape it can be also used as a maternity pillow, also will be great to use behind the baby to teach him to sit properly. But some moms were not comfortable with it during breastfeeding; they said it’s not a good breastfeeding pillow rather than a bed partner. However, you can check here for more details. Dr. Brown brings new angle in nursing pillows. This Gia offers a wide range of ways to position the pillow for comfort. Its unique design makes holding the baby easier by raising his head, thus your baby gets a natural slope which reduces gas and split up. The 100% cotton made stitched cover covering the polyester fill inside it, so it can provide you a better feel. You can wash the pillow with or without cover. You will get freedom during washing as both pillow and covers are machine-washable. Though some moms don’t like the bulky breastfeeding pillows like that, the good point is that you don’t have to use any additional pillows. Overall you can go for this very firm and large pillow for nursing as well as bottle feeding. Click to check the price. The design of Ergobaby is a little bit different from others. It’s a super firm and well-stitched breastfeeding pillow and the most special feature is the curve as their commitment. But personally, I didn’t like the curve as it’s angled in a way that your baby will always fall down towards you. But if you can consider this point, there are so many other reasons to buy it. 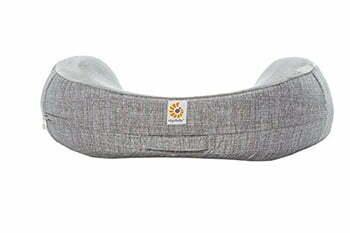 This pillow can save your back, neck, and arms from being strained than other pillows. Its soft inner side will make your baby feel that he is on your arm. The pillow is attractive to look at with the plush fabric on the top. Machine washable and removable cover added a great value to it. 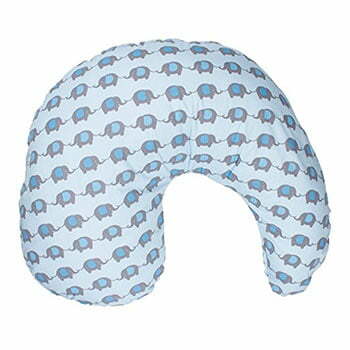 If you are looking for a nursing pillow for more than one-year-old baby you can go for it. Though the price is a little bit higher, I think it will not be a bad deal. What is a nursing pillow? Breastfeeding pillow is not just only a household product; it’s almost like having an extra arm. Generally they are circular or rectangular and also the other shape. But we prefer the circular one as this is good enough to snuggle against your abs. Actually, nursing pillows were designed to prop up babies who aren’t ready to sit on their own, but later people started using them to help them nurse and now, these pillows are on many “must have” checklists. Nursing pillows are not so soft like bed pillows, your baby will not sink down and he will get enough support from it. Why you need a breastfeeding pillow? Every mom likes to hold their baby within their arm, but it’s not possible to hold her all day long. You can cuddle her in your arms while you breastfeed, but held for long times starts to pain on your shoulders. That’s why now a day, moms are using nursing pillows as a necessity. It lifts your baby up to the right height for breastfeeding so you don’t have to lift her by using your arm, that helps you relax and concentrate on other things while breastfeeding. Size and fitting is the first thing to consider while buying a nursing pillow. Most of the moms prefer a size that her baby has needed to lie on while feeding. Some others want a compact and easily portable pillow for the ease of travel. The pillow should be firm enough to provide support on baby’s body, especially on her neck. You need to select one that your baby should be able to lie comfortably with the head facing your breast. Don’t go for any pillow which is too high. The average cost is between $25 to $50. If you are looking for a nursing pillow for twins, there are some pillows specially designed to accommodate twins, which will cost about $100. Before buying please ensure that the pillow is with a removable slipcover that you can wash it easily. Though the non-washable are less expensive, we recommend you to go for a washable one. Check the quality of the materials used to make it, if you are planning to buy this for one year or even longer. If you are thinking to use it for just a few months then durability isn’t so much important. 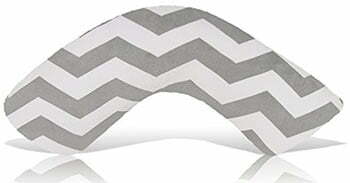 Take a look at our another review article on breast pads. Buy a baby memory book to keep your baby’s memory alive. Here is some more nursing related article you may like to take a look. Be with momion, we are for you and your minion. This post may contain affiliate links. If you click and purchase something that we have recommended, we may receive a commission. But clicking on these links won’t cost you any extra money, it will help us keep this website running. Thanks for being with momion.